In an emotional farewell, Discovery has undocked and departed from the International Space Station (ISS) for the final time in her career. 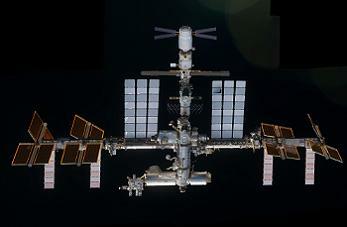 The undocking occurred at 6:00am Central Time, ahead of a stunning flyaround of the orbital outpost. As the two vehicles grow the distance between each other, the STS-133 crew completed Late Inspections on Discovery’s heatshield, in preparation for Wednesday’s landing. Discovery’s crew – who had closed the hatches between the Shuttle and Station on Sunday – woke up to a specially recorded version of the original Star Trek theme, which had been re-voiced by actor William Shatner in tribute of Discovery, after gaining the second amount of votes in an online wake up song contest. In preparation for undocking, the ISS’ Solar Alpha Rotary Joints (SARJ) were locked, and the four giant arrays were feathered, so as to protect the arrays from plume impingement as Discovery pulses her Reaction Control System (RCS) jets to move gently away from the orbital outpost. The arrays on both the European ATV-2 (Automated Transfer Vehicle) and those on the Russian segment, were also feathered for the same reason. In providing the required approval for the undocking, the Mission Management Team (MMT) met to discuss any hardware issues with the veteran orbiter – of which there are none. “The MMT met briefly today to review the orbiter systems and mission progress. Discovery continues to perform flawlessly and the teams are working no issues. The MMT gave an unanimous go for Undocking,” noted the managerial meeting. “The MMT was thankful for a superb docked mission. The teams went above and beyond expectations. 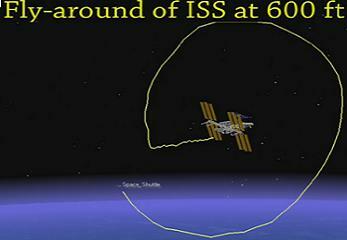 This is a testament of the outstanding teamwork both up on the ISS/Shuttle complex and the ground. Enjoy the view of the Flyaround!,” added notes in the FD12 Executive Summary. Led by STS-133 Flight Director Bryan Lunney, Discovery and her crew performed the complex undocking and seperation profile without issue. 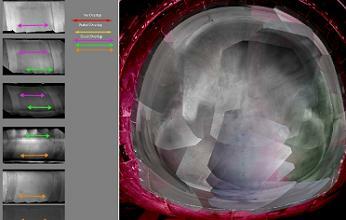 “Separation profile designed to minimize plume impingement and propellant usage. 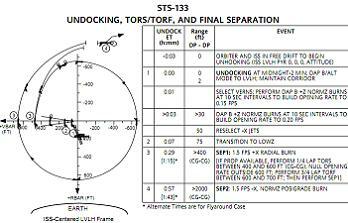 Initial separation sequence combines attitude control firings and +Z burns to achieve opening rate,” outlined a STS-133 flight profile presentation (L2). “ALT DAP (Digital Autopilot) mode with 0.08 sec. on time limit and variable 10 sec. delay required for attitude control. DAP B and 10 sec. intervals required for +Z translations inside 75 ft. Timing and burn size constraints imposed to protect solar arrays of the Russian docked vehicles. “Prior to 50 ft., single -X jet configuration continues to be used to avoid requiring a new Loads jet-firing database. 8 degree corridor separation along the +Vbar. Inside 150 ft., ±Y pulses restricted to DAP B. LOWZ between the ranges of 75 ft. and 1000 ft.
As noted, Discovery carried out a full flyaround of the ISS she helped build over the latter years of her 39 mission career, providing an amazing view of a station, which is host to number docked vehicles, such as ATV-2, the Japanese HTV-2, and several Russian vehicles. There had been some hope for a unique view of the Station with Discovery docked, that was to be provided by a Russian Soyuz “Flyabout” during the docked mission. However, despite what is understood to be split opinion between Russian managers (RSC Energia and Roscosmos), the decision was to opt against the historic event due to the risk of using what is effectively a test flight of an upgraded Soyuz. With Discovery departing the Station, ISS crewmembers have only a few housekeeping items on their schedule, prior to a well-deserved rest after hosting the STS-133 crew. “Overview: Shuttle undocking is early in the crew day. The Shuttle crew performs fly-around and late inspection using OBSS. The ISS crew performs standard post undocking activities to stow the BPSMU, depress PMA2 and remove the CO2 remediation ventilation ducting,” noted a Flight Plan Walkthrough document (L2). Lead by Commander Scott Kelly, the ISS crew gave Discovery a fitting departure from the Station, following up Flight Day 11’s traditional US Navy dedication of “We’re going to miss Discovery. A great ship. We wish her fair winds and following seas (FWAFS),” with a four bell salute to the departing flagship of the fleet. Discovery crew still had a busy Flight Day 12, with a several hour task of carrying out Late Inspections on the orbiter’s critical Reinforced Carbon Carbon (RCC) panels and areas of her Thermal Protection System (TPS). 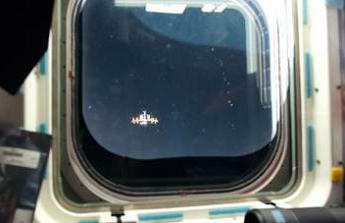 This operation mirrored Flight Day 2’s survey via the Orbiter Boom Sensor System (OBSS), providing imagery for the Damage Assessment Team (DAT) to clear the vehicle for Entry. 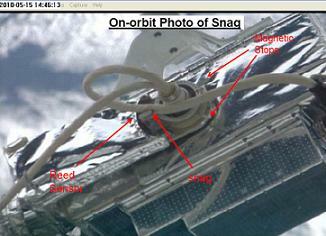 There haven’t be any repeat issue with the OBSS cables, following mitigation after STS-132’s issues. The surveys were completed without issue. In the highly unlikely event of a major problem being found on Discovery’s TPS, the orbiter will be able to return to the ISS under a safe haven scenario, allowing the crew to await rescue from Endeavour next month. Discovery is currently scheduled to return to Earth on Wednesday, with the opening landing opportunity resulting in touchdown at 11:58am Eastern at the Kennedy Space Center (KSC). (Further articles will follow. L2 members refer to STS-133 live coverage sections for internal coverage, presentations, images and and updates from engineers and managers – for full and extensive live Flight Day coverage during the mission. Images used: Lead and within the article via L2’s large collection of unpublished STS-133 mission photos. Graphics via L2 presentations).